For the latest Classic Albums DVD, we head back to 1967 to check out The Doors, the LA band’s first album. 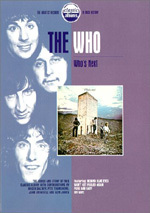 The DVD follows the usual blueprint for the Classic Albums programs, as it presents band members and others connected with the Doors to detail the music and its creation. We hear from band members Ray Manzarek, Robby Krieger and John Densmore, road crew/manager Bill Siddons, friend/poet Michael McClure, recording engineer Bruce Botnick, friend/filmmaker Paul Ferrara, Columbia Records’ Billy James, Whisky A Go Go co-founder Mario Maglieri, Elektra Records founder Jac Holzman, KLOS DJ Jim Ladd, journalist/author Ben Fong-Torres, and musicians Perry Farrell and Henry Rollins. 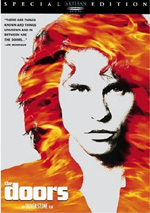 Doors looks at the origins of the band and their impact on the rock scene of the time. It also involves the band’s influences, their development, and the recording of The Doors. Finally, we get some notes about singer Jim Morrison and the band’s legacy. That template holds true for The Doors. Botnick leads us through elements of the original recordings from a spot at the mixing board; he presents isolated elements from “Break On Through”, “The Crystal Ship”, “Back Door Man”, “Soul Kitchen”, “Alabama Song”, and “The End”. In addition, the three surviving Doors let us hear new performances of their work individually. Manzarek provides organ demos for “Break On Through”, “Alabama Song”, “Light My Fire”, “Soul Kitchen” and “The End”, while Dunsmore drums for “Break On Through” and “Light My Fire”. Krieger throws out some guitar work for “Break On Through”, “Soul Kitchen”, “The End” and “Light My Fire”. In addition to those modern elements, we get some snippets of vintage the Doors from the Sixties. However, we find less of these different performance elements, and some of them come from lip-synched sources. The most interesting snippet shows the band’s infamous rendition of “Light My Fire” off of The Ed Sullivan Show, though we don’t see much of it. Having experienced quite a few Classic Albums releases, I can’t say that The Doors does anything fresh or new. However, it doesn’t need to alter the existing template. We probably get too much general band history than necessary, though. Folks who get Classic Albums DVDs probably already know a lot about the bands in question, so we don’t need the five-cent history. We want insights about the recording specifics. And we especially want the musical demos. I love the mixing board elements; I’d happily watch a full hour of those bits alone. The demos from the band members are also quite fun, especially when we hear about influences and how the pieces came into existence. For existence, the Doors tell us a little about what songs they stole from for some licks. These various factors combine to make The Doors a winning take on the album. I can’t call myself a fan of the Doors; in fact, I pretty actively dislike them and all their pretensions. Nonetheless, I can’t deny that they were a major force in the history of rock, the The Doors gives us a nice look at their debut. 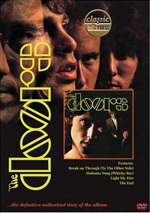 Classic Albums: The Doors appears in an aspect ratio of 1.78:1 on this single-sided, double-layered DVD; due to those dimensions, the image has been enhanced for 16X9 televisions. Overall, I thought the DVD offered decent but unspectacular visuals. The program seemed to display no significant jagged edges or moiré effects in the new bits, though archival pieces could look ropy. I also saw no evidence of edge enhancement. The older footage showed a mix of small print flaws such as grain, grit, speckles, and some spots, but for the most part those elements appeared reasonably decent. As for the modern shots, they demonstrated a bit of grain but otherwise lacked flaws. Most of the Classic Albums releases feature fairly subdued colors since they take place in studios and other indoor settings. Doors followed along those lines, but the tones looked more warm and inviting than usual. Some gently vivid hues emerged in the modern footage. Colors were paler during the archival shots, but they seemed acceptable. Black levels looked fairly deep and rich for the new stuff, while shadow detail appeared clear and accurate. Overall, you won’t view Doors for its dynamic visuals, but it adequately represented the original material. Similar feelings came with the Dolby Stereo 2.0 soundtrack of Classic Albums: The Doors. Not surprisingly, this mix stayed with a front-oriented presence that largely hewed to the original stereo presentation of the music. Virtually everything other than the songs stayed in the center; I detected no evidence of effects or dialogue from anywhere other than the middle speaker. The music showed good stereo separation, though I expect some of that may have resulted from the original production of the album. Overall, it seemed like the music provided clean spread across the front, and the track used the rears for decent reinforcement of the songs. Audio quality was somewhat erratic but generally positive. Dialogue was reasonably natural and distinct. As for the effects, well, there really weren’t any; this production featured music and dialogue almost exclusively. Of course, the songs were the most important aspect of the mix, and they came across well. The original tracks from Doors fared best of all, as they showed decent clarity and depth. Archival footage worked acceptably well, though of course it displayed a fair amount of variation. Those segments were usually clear but somewhat thin and flat. As a whole, the audio seemed good but unexceptional, largely due to the variety of source materials. In terms of extras, this one comes with 11 Additional Interview segments. Taken together, these last a total of 36 minutes, 59 seconds. We get notes from Doors band members Ray Manzarek, John Densmore and Robby Krieger, recording engineer Bruce Botnick, and friend/poet Michael McClure. The three surviving Doors heavily dominate the proceedings, as they show and tell us more about the recording of the songs. We also hear a demo of “Moonlight Drive” plus two versions recorded during the first album’s sessions but not used. Of all 11 clips, only the one with McClure bores. It extends a scene found in the main program during which he reads the lyrics to “Break On Through” and acts like they’re brilliant poetry; they’re not, and this becomes by far the most pretentious part of the show. On the other hand, we hear some funny stories about Morrison’s LSD trip in the studio and how a televised baseball game interfered with the recording sessions. The notes about the music also fare well, and we get a good collection of extra tidbits. Just skip the segment with McClure and you’ll enjoy these outtakes. Music fans have come to look forward to the Classic Albums DVDs, and The Doors provides another winner. The album – and the band – don’t do much for me, but I like this entertaining and informative look at a legendary debut release. The DVD presents perfectly acceptable picture and audio along with some useful added footage. I recommend this release for all fans of classic rock; even if you don’t dig the Doors, you’ll want to give this absorbing documentary a look.